27 p. : col. ill. ; 23 cm. Introduces the six superheroes that make up the Avengers. 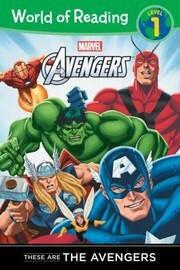 These are the Avengers / adapted by Thomas Macri ; illustrated by Mike Norton and Hi-Fi Design. 100 Personl Name ME 1 $a Personal name Macri, Thomas. $c Statement of responsibility adapted by Thomas Macri ; illustrated by Mike Norton and Hi-Fi Design. 500 General Note $a General note "Based on the Marvel comic book series The Mighty Avengers." 500 General Note $a General note Cover title: The mighty Avengers :. 520 Summary Etc. $a Summary, etc. note Introduces the six superheroes that make up the Avengers. 830 SAE:UnifrmTitle 0 $a Uniform title World of reading. $n Number of part/section of work Level 1.